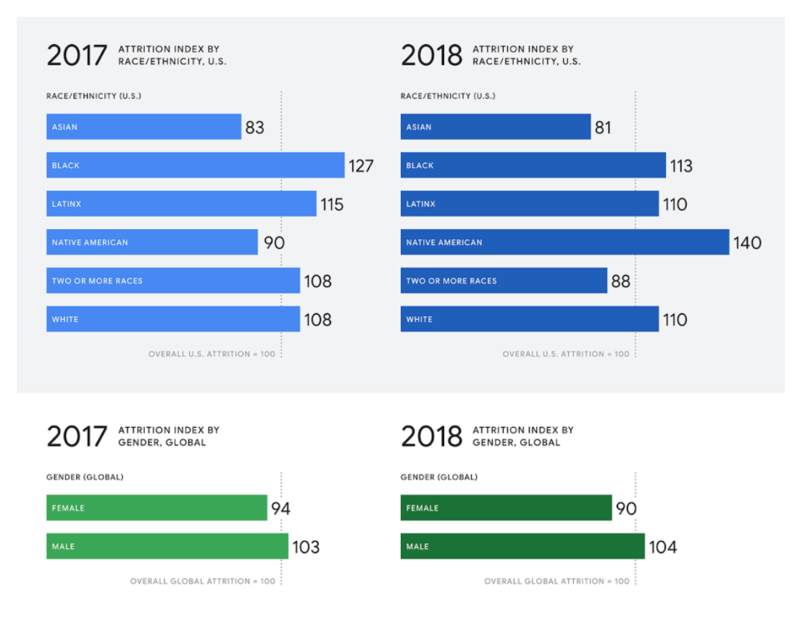 Believe it or not, the retention of black and Latinx employees at Google was better last year than in 2017. Though, Google’s attrition rates of black and Latinx — which indicate the rate at which employees leave on an annual basis — are still higher than the national average. For Native American employees, Google’s attrition rates significantly increased from the year prior. To be clear, that’s a bad thing. For what it’s worth, Google is also not great at retaining white employees. Google publishes the data as a weighted index and treats the average attrition rate as 100. The closer each group is to 100, the close to parity Google is. If a group’s index is 90, that means the group’s attrition rate was 10 percent lower than the average. Google released its first attrition index last year to show how many employees left the company on annual basis. Based on last year’s data, it was clear Google had the hardest time retaining black and brown employees. In fact, black and brown people were leaving Google at rates faster than the national average. A highlight, however, was that women were leaving Google at lower rates than the average. And this year’s data for women is slightly better, with an attrition rate of 90 compared to 94 the year prior. But we’ll see how the latest wave of controversy (harassment, walkouts, etc) at Google affects its attrition rates for 2019.